Well over a decade ago, Trilobyte released an adventure game that has most certainly left its mark in the genre. Taking players through the rooms of a cryptic mansion, The 7th Guest put the focus almost entirely on the puzzles. Each room had a different twisted puzzle. As you moved from one challenge to the next, additional rooms became unlocked and the story unfolded through visions of ghosts. The old man Stauf’s mansion made for an eerie, surprising, and sometimes downright corny place to explore. While The 7th Guest hardly scored any points for its incoherent plotline, its distinct structure and devious puzzles nevertheless made it a significant and quite successful game. 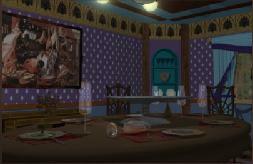 After three years of development, The 11th Hour followed The 7th Guest. 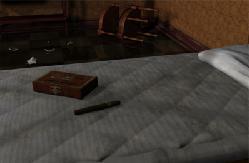 Giving players another chance to explore Stauf’s mansion, The 11th Hour offered puzzles similar to what was available in its predecessor along with hunt sequences where players went about the house looking for various items. The story was not meant to end with The 11th Hour, but alas the game performed poorly in terms of sales and the third chapter in the series was never completed by Trilobyte. But dedicated fans of the series have taken it upon themselves to change all of that and create a new sequel. 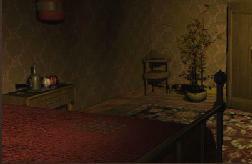 The 13th Doll will reunite players with Tad, the seventh guest in the original game. Tad has managed to survive the events, but he is now institutionalized. And the images of the past continue to haunt him. Tad remembers the ones he could not save. In a different time and at a different place, he is disillusioned and has just about given up all hope. Going back to the mansion and setting things right seems like an impossible dream. But the current is changing once again. And the right time might finally be at hand. It all begins with the arrival of a new doctor. This young man could be just what Tad needs to get out of the asylum. As the doctor and the patient meet, everything hangs in balance. Can this really be the opportunity to vanquish Stauf’s evil once and for all? Or will the madman’s evil triumph over Tad and the doctor? It is hard to guess what the outcome might be. But one thing is certain. The cryptic mansion and Stauf’s treacherous games beckon once again. It is time to explore the crumbling old house one more time. Perhaps this time it will be possible to set everything right. The 13th Doll is a very ambitious project to deliver a new sequel to The 7th Guest and the 11th Hour. A small group of fans have come together to create an experience similar to the original games while adding a touch of innovation. Among the most interesting aspects of The 13th Doll is the fact that players can choose to control either Tad or the young doctor. As detailed on the official Web site for The 13th Doll (www.t7g3.com), the choice is far from being superficial. 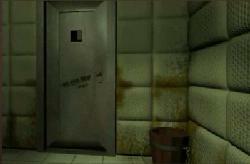 Depending on which character you choose, different rooms and different puzzles are planned to be available. Going through the game as Tad or the doctor should provide a unique perspective into the events. In addition, each character’s story arc is expected to have multiple endings giving the game significant replay value. While The 13th Doll is being conceived as a 3D game, the actual game play mechanics are expected to be close to what was featured in the first two games. Players will utilize a mouse-driven interface to navigate through the game. Being a chapter in The 7th Guest series, players should also be able to expect a healthy dose of tricky puzzles to solve. Viewed from a first-person perspective, the game is also expected to feature real actors just like the first two installments in the series. While Stauf will undoubtedly be an important part of the game, it is unknown whether or not Robert Hirschbeck will reprise his old role. The official sequel for the 11th Hour was supposed to be called The Collector. Yet years after the original announcement about the game it should be pretty safe to assume that The Collector is firmly lodged in the ever-growing list of games that were planned but never completed. While the development team behind The 13th Doll is quick to point out their venture is not meant to be an official sequel, it is great to see a talented group of people take it upon themselves to continue the series. When it is completed, The 13th Doll will be released as a freeware game. Taking the intriguing storyline and the promising graphics into account, it might come as a surprise that this game would be offered as freeware. With two playable characters, multiple endings, and plenty of game play time, The 13th Doll sure seems to have the makings of a commercial release. However, primarily due to potential copyright issues with the creators of the original games, the development team seems adamant of providing the game as freeware. The 13th Doll is a project that has already been in development for quite some time. However, the official game Web site seems to have an active community and the developers seem to be intent of completing the project. As the members of the development team are working on The 13th Doll entirely as a volunteer effort, it might be a while before we get to play the game. There is no official release date. As is the case with many independently developed freeware games, The 13th Doll will be ready when it’s ready. Nevertheless, based on the information currently available, The 13th Doll looks quite promising. Attic Door Productions could easily end up delivering a remarkably successful fan game. It should be very interesting to see what will be end result of this tremendous undertaking by a small number of dedicated fans. And who knows, maybe The 13th Doll will even shed light on some questions you may have left unanswered in the first two games of the series.